John Arnold has made billions as an energy-trading phenom. But the rules of his game are about to change. 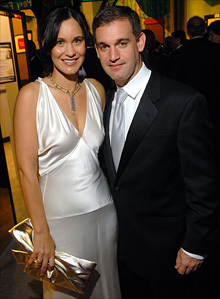 John Arnold with his wife, Laura, at a benefit for the Children's Museum of Houston in October. John Arnold earned one of the biggest hedge fund paydays last year. Source:From Institutional Investor's Alpha highest-earning hedge fund managers list. (Fortune Magazine) -- You could hear John Arnold trying to choose his words carefully. Seated at a conference table inside a drab government building in Washington, D.C., in August, Arnold hardly fit the stereotype of a swaggering, 35-year-old billionaire natural-gas trader. He wrung his hands as he waited to speak and twisted his wedding band. He filled, and refilled, and re-refilled his water glass. Then he stuttered a bit before he gained momentum and politely advocated rules that would restrict others while allowing him to keep doing what he does. It was a rare public appearance for one of the least-known billionaires in the U.S. But the stakes were high. Arnold was testifying at a hearing of the Commodity Futures Trading Commission (CFTC). Commodity prices have been especially volatile in recent years -- skyrocketing and then crashing to earth -- and the federal regulator is considering dramatic rule changes to rein in speculators, whom many blame for the gyrating prices. Arnold would tell you -- if he were inclined to tell you anything (and he rarely is) -- that he's a speculator. He might say, though, that that's not a bad thing to be. But call him what you want -- nobody has profited more when it comes to natural-gas trading in recent years. His Houston-based hedge fund, Centaurus Energy, which manages more than $5 billion in assets, has never returned less than 50% in seven years of business. Arnold's wealth reportedly constitutes a large chunk of the fund, which would make him the second-youngest self-made multibillionaire in the U.S. -- behind Facebook's Mark Zuckerberg (assuming you believe the social-networking company's theoretical valuation). Arnold has the brain of an economist, the experience of a veteran gas man, and the iron stomach of a riverboat gambler. Perhaps most notable, though, is his uncanny ability to extract colossal profits from catastrophic circumstances. He began his career as a wunderkind twentysomething trader at Enron -- and escaped that disaster not only with his reputation intact but also with the biggest bonus given to any employee, which he used to seed a new fund. A few years later he earned $1 billion betting that natural-gas prices would go down just as a reputedly brilliant gas trader at Amaranth made a spectacularly disastrous bet in the opposite direction. More recently, as the commodities bubble burst in 2008, taking even more fund managers with it, Arnold foresaw the looming collapse and once again nearly doubled his money. But now he faces the biggest test of his career. His mojo relies on his ability to make enormous bets. The CFTC, however, has vowed to impose trading limits that would target the industry's largest players. That, say observers, could be a dose of kryptonite for the supertrader. As Arnold put it at the hearing, carefully reading from a prepared statement, "If allowed to take effect as currently structured, the new [position limits] will have a range of detrimental effects on the market." That qualified as a bold public statement by his standards. But Arnold, who declined to comment for this article, is not fighting -- he's adapting. Besides wooing regulators in Washington, he has entered new corners of the business: buying natural-gas caverns, a prescient move that has made him a key middleman in the energy economy, and breaking into the next frontier in energy trading, liquefied natural gas. "He's like a poker player who can see everyone else's cards," says a longtime trader who has known Arnold since his Enron days. But whether Arnold will emerge from the regulatory storm the same way he has from past squalls -- not only intact, but billions richer -- is less certain. There are two kinds of natural-gas futures: the physical kind, in which investors enter a contract to buy or sell natural gas on a given day, and virtual ones, in which no gas trades hands. The latter are effectively side deals known as "swaps." If a gas producer like Chesapeake Energy (CHK, Fortune 500) is worried that prices are going to fall below a certain level, for example, it can make a deal with a hedge fund like Centaurus that will pay an agreed amount if prices drop. But if they go up, Chesapeake has to pay out. Centaurus, which started in 2002 with just a handful of traders and now has 70 employees, focuses on this virtual kind of trading. Still, Arnold, an intense worker with a wide network of contacts, aims to win by understanding the fundamentals of the gas market better than anyone else. As Arnold told the CFTC (in one of the few statements he made that wasn't steeped in trading jargon), "I try to buy things whenever they're trading below what [our] analysis shows to be fair value and sell things whenever our analysis shows that the forward curve is higher than our analysis of fair value." In his early days at Enron, Arnold made a name for himself by buying gas contracts in one region and selling them in another when their prices diverged because gas couldn't travel easily between states. In 2000, however, Congress passed the Commodity Futures Modernization Act, which allowed contracts tied to commodities to be exchanged in vast quantities, sparking a boom in electronic gas trading. (The law became known as the "Enron loophole," thanks to heavy lobbying by the then energy-trading giant.) Arnold's early trading experience, which gave him insight into the needs of gas customers all over the country, lent him an edge once virtual trading took off. Arnold combines that knowledge with a willingness to make giant moves. Indeed, Centaurus earns the lion's share of its profits on a small number of enormous trades. "He only really puts on a trade of substance once or twice a year," says a person familiar with the fund. "But when he goes for it, he's so big he makes a fortune each time." It's been a hugely rewarding strategy, but also a risky one. It means that Arnold himself may be just one missed wager away from his own blowup. Arnold's ability to make megabets is helped by the fact that the fund has been closed to new investors since 2005. He has repaid nearly all his investors and now invests only his and his employees' capital, with none of the strings that come attached to other people's money. "He and those lucky enough to be in his inner circle have a huge edge in that they can do whatever they want," says a commodities fund placement adviser. Traders familiar with Arnold's style also credit a calm and disciplined manner that helps him stay eerily focused on the fundamentals of the market when other trades are creating distractions. That was on display most notably during the Amaranth debacle. Amaranth, a $9 billion commodities hedge fund in Greenwich, Conn., was betting that natural-gas prices would rise in the winter, according to a Senate report that shed light on what happened in September 2006. But as the season wore on, meteorologists began predicting a mild winter, and prices turned downward. Amaranth trading prodigy Brian Hunter started bleeding money, facing $3 billion in margin calls at one point. As Hunter worked late on a Saturday in what would become a cataclysmic weekend for him, he e-mailed Arnold and tried to persuade him to buy Amaranth's positions before the market opened on Monday. Arnold wrote back the next morning, explaining that he hadn't been in the office for a couple of days, and coolly rebuffed Hunter. The price was "still a long way from fundamental value," Arnold argued. In fact, he had separately been buying contracts that would pay off if prices tumbled even further -- and he was dead right. Arnold's timing was "remarkably accurate," according to the Senate report. Centaurus went on to 200% gains that fall, while Amaranth was forced to liquidate. Centaurus's trading in those months netted nearly $1 billion. The result was a reported 317% return overall for Centaurus in 2006, a year when another natural-gas fund, MotherRock, also imploded trying to sustain a losing bet. While others had panicked, Arnold had remained patient, waited until the right moment, and then opportunistically relieved others of their money. The best compliment may have come from a competitor who once described Arnold and his trading team to reporters as "like being on the Yankees, and he's Babe Ruth." Commodities trading isn't the sort of profession that most children dream of going into. But by college, Arnold, who grew up in Dallas (his father, who died when Arnold was 17, was a lawyer), was showing an aptitude for numbers and complex calculations that can mark a great trader. He attended Vanderbilt University, where professors remember him as an economics whiz, able not only to understand concepts instantly but also to do complex math in his head. It was at the Houston energy company, under the tutelage of a stellar roster of traders, that Arnold really blossomed, becoming a well-paid star in the late 1990s. On Enron's natural-gas trading desk, which handled contracts totaling more than $1 billion a day, when he was only in his mid-twenties, Arnold alone reportedly earned Enron nearly $750 million in 2001. One colleague dubbed him the "king of natural gas." After the accounting scandal brought down the company (the fraudulent schemes had little to do with Enron's legitimate trading business), UBS (UBS) bought the trading team and gave Arnold an $8 million bonus to stay. But he left, and eventually recruited former superiors like Greg Whalley, the last president of Enron, and trader Mike Maggi to reassemble a rump Enron team at Centaurus. He has also cherry-picked traders from other firms that have blown up. Despite the scandal, natural-gas traders such as Arnold managed to retain their reputations, and the fund was able to launch fairly smoothly, aided by a wave of investor interest, first in hedge funds and then in commodities. Starting with smaller swaps, Arnold was able to rapidly build his firm. One trade is typical -- the details of which come from a later court filing over a pricing dispute. In 2005, in the months leading up to hurricane season, Centaurus entered into "swing swaps" with producer BP (BP). BP, which sells gas that travels through ports in Louisiana, was worried that prices might decline. Centaurus's meteorologists, however, apparently anticipated an intense hurricane season, which would probably drive up prices. So Centaurus agreed to pay BP if prices slumped -- and vice versa if prices rose. When hurricanes Rita and Katrina devastated the Gulf Coast, gas skyrocketed, and Centaurus took home $3 million. "They're gunslingers," says one lawyer who worked with BP at the time. "When you've got that much money, you can be everywhere at once, buying when others are selling, and always winning." Halfway between Houston's downtown and uptown areas sits River Oaks, a historic neighborhood home to Houston's moneyed elite. Saudi princes and local notables like former commerce secretary and oil man Robert Mosbacher own houses there; it's said to be one of the wealthiest zip codes in the country. Bayou Bend, an estate built by Houston's legendary Hogg family and now owned by the city's Museum of Fine Arts, is perhaps the most spectacular of all the homes. The preserved 1920s country estate is surrounded by lush, imaginative greenery. At the rear of the gardens, however, a jarringly angular modern edifice is under construction. That's where John Arnold is going to live, in a 20,000-square-foot homage to cubism designed by New York architect Alexander Gorlin (Arnold also interviewed Robert A.M. Stern for the job). To build the home, Arnold had to tear down a creaky old estate called Dogwoods. That drew the ire of preservationists, who held a candlelight vigil in protest. Arnold won them over, arguing that by hiring a high-caliber architect, he would be creating a landmark, not a McMansion. Like many a hedge fund manager, Arnold has strived to keep his life private. Unlike most managers, however, Arnold once worked at a company that was heavily investigated. The result: a trove of decade-old e-mails in the public record that offer glimpses of a typical twentysomething. Arnold bought tickets to see the Dave Matthews Band and U2, and followed the Houston Astros and English Premiere League soccer. (He still plays soccer in a men's league every weekend.) He talked about getting drinks with his colleagues, and planned family vacations with his mother and brother. Then and now, Arnold may have been one notch nerdier and more self-effacing than the average Enron trader. But he showed more than a touch of a trader's bravado. In one e-mail, he vowed to "squeeze all the fuckers" who he thought were wrongly betting on the direction of gas. Today Arnold can afford a little swagger and a lot of the good life. He and his wife, Laura -- a Yale Law grad who once worked at the powerhouse law firm Wachtell Lipton and started an energy-exploration firm -- are modern-art collectors and have become known in philanthropic circles. They have donated $700 million to a family foundation that gives money to charter schools run by an organization called the Kipp Academy, on whose board Arnold serves. Laura recently joined the board of Teach for America. "Once you get past a certain level of income," Arnold told friends at an alumni event at Vanderbilt, "it's all about the philanthropy." Arnold's generosity, however, won't win him any friends among those who want to restrict commodities traders of all stripes. Observers say the CFTC is unlikely to budge on its vow to put position limits on market players. As a former Goldman Sachs executive, chairman Gary Gensler is market-friendly but strongly believes liquidity is best created by having many small traders, not several large ones. Energy traders like Arnold counter that the big players help the market, both by providing liquidity when supply is threatened and by keeping prices in check with a willingness to short the market. As the debate goes on, Arnold seems to be preparing for a future in which natural-gas trading is more limited. Centaurus has made investments in exploration and production companies; it has also hired liquefied natural gas traders in London. Most significant, Arnold has become an energy market middleman by investing in valuable natural-gas storage facilities. A huge glut in supply, plus a dropoff in demand from mild seasons and reduced industrial need, has resulted in rock-bottom gas prices. So players are rushing to store gas in hopes of selling it when prices are higher. In 2006 Arnold formed NGS Energy, which has carved a series of battleship-size storage caverns inside underground salt domes. "This is the opposite of a speculative play -- it's a bet on the future needs of the marketplace," says Laura Luce, a former Enron colleague of Arnold's who runs the venture. Natural gas's storage and transportability as a fossil fuel, she says, also make it a key cog in the renewable-energy economy: "When there's no wind or sun, you fill in with the cleanest energy available, and that's gas. That's why gas storage is going to be a great business." Of course, Luce is the one who makes the public pronouncement. Arnold, by contrast, is hardly in danger of becoming the sort of gas evangelist who appears in TV commercials, like his energy-trading colleague and fellow Texan T. Boone Pickens does for wind and natural gas. In trademark fashion, Arnold is staying behind the scenes and working on how to profit from the next disaster.